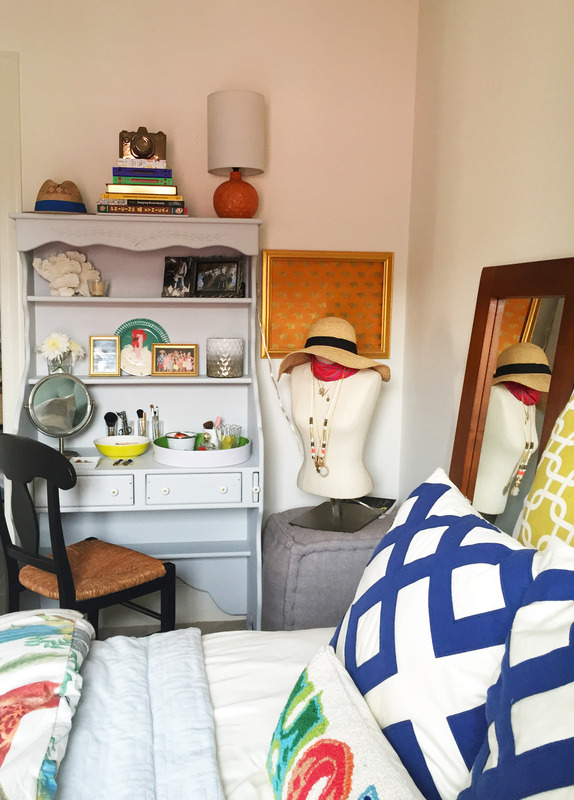 When you grow up and it’s time to leave the nest, you take many things with you: life lessons, mom’s sugar cookie recipe, and, for most of us, your childhood bedroom set. Nothing says adulthood like a throwback to middle school sleepovers. My lucky inheritance: a 50-year old, Amish secretary desk. I’ve squirmed at this desk since my 11-year old, tomboy-self noticed the “flowery” carvings at the top of the secretary. Thirteen years later, there I was: still under-joyed by the handcrafted piece of furniture. It was finally time. I had to bite the bullet and paint the sucker. Rules Worth Breaking – never paint over the natural look of wood, whether it’s furniture, trim/panelling, or an antique trinket. The fact of the matter is, sometimes things need a facelift… a fresh perspective… a little light. Take it from the experts at Domino (shown below) who are no strangers to painting a wood panel or two in order to make a statement. 1. Does the wood furniture need to be sanded? Yes if the wood is pre-finished. Lightly sand enough to dull the finish so the new paint will stick better. 2. Do you need to prime the wood? No if you are using chalk paint. Chalk paint serves as a paint and primer duo and can be sanded down to achieve a distressed finish. 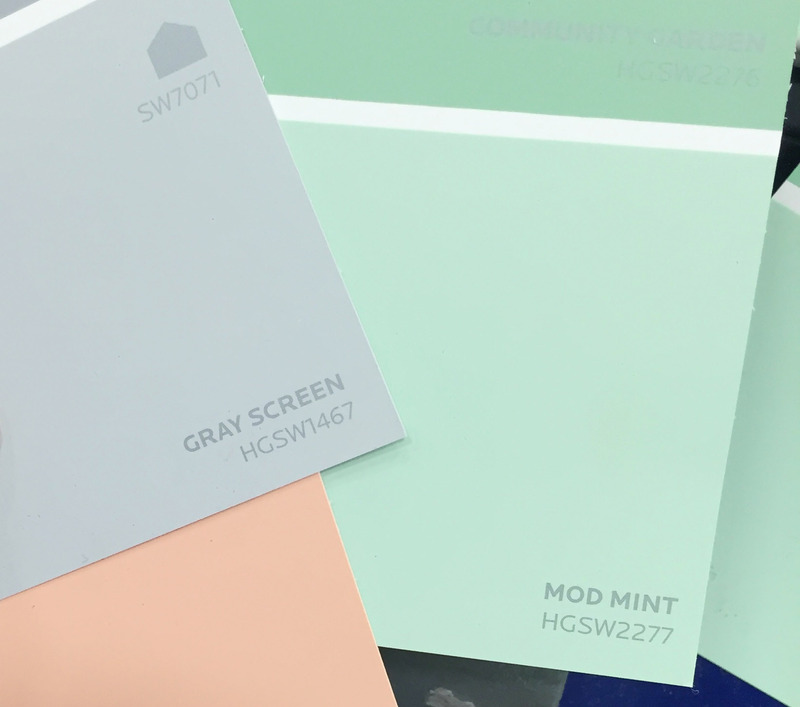 Ask your hardware store’s paint specialist what kind of primer is best for your specific furniture. 3. Will I need multiple coats of paint? Most likely, yes. If the wood has not been finished before, it will soak up the primer and paint, thus needing more layers of paint. 4. How do I know what paint finish to choose? This is by preference. Most design guru’s are going for a matte finish as seen in the Domino images above. If you want a glossier undertone, move up to a glossy finish. For a distressed look, try coating your piece with chalk paint and then lightly sanding it down. Knobs can make all the difference. They are the accessories of a piece of furniture. Find funky, unique knobs at Anthropologie or Hobby Lobby. I chose to stick with the original (handmade!) ceramic knobs on my secretary desk for an understated look. 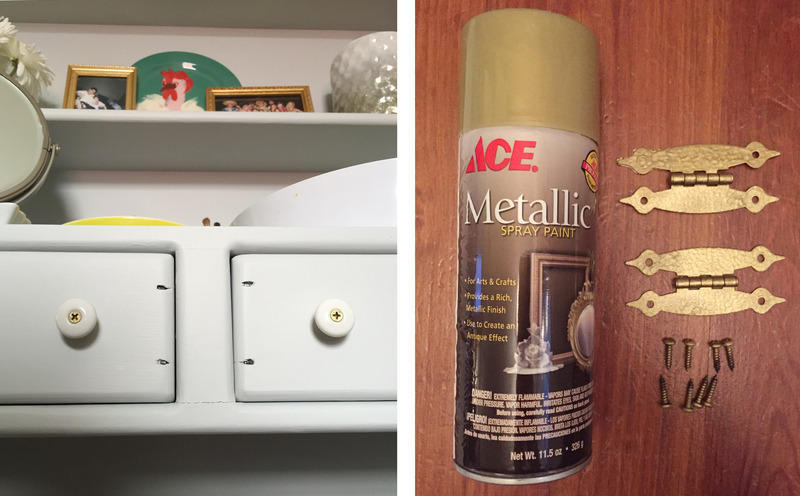 To add femininity, I spray painted all of the screws/hinges gold. It’s the little things! Drawers leave room for some fun. 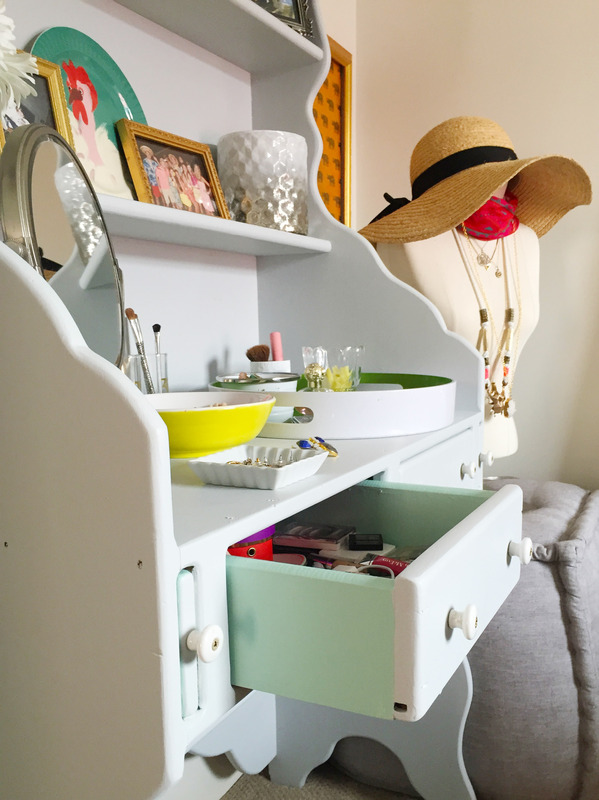 I painted the inside and sides of my secretary’s drawers a soft mint color to mimic the pattern of my bedspread. The hidden pop of color adds an extra surprise to the desk. Looking for a bigger impact? Paint the entire backing of the desk a bright color. This secretary had some growing up to do. No longer a tomboy’s homework station, it’s now used as my vanity. Since I went with a light cool gray color, I brought in lots of bright color with make up trays and jewelry bowls. 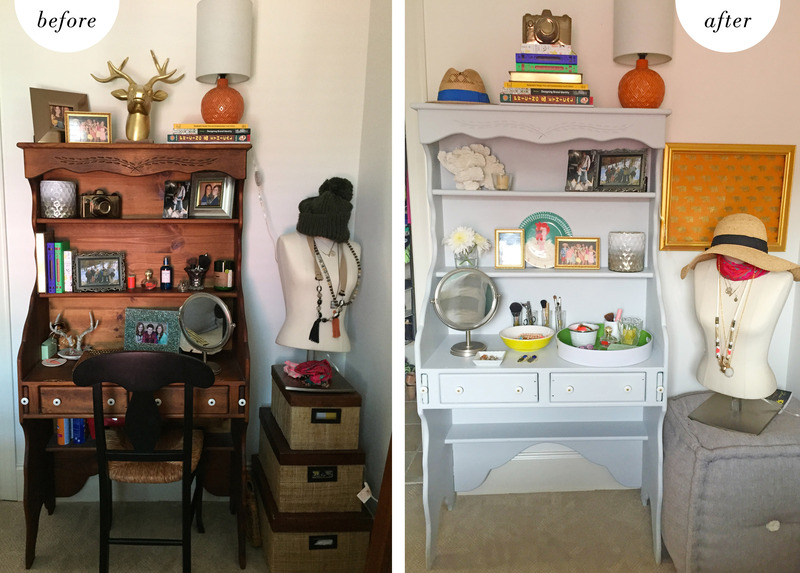 Show me your refinished furniture projects by using the hashtag #boldwithblanc. Great post today! The desk looks amazing! Thank you, Emory! It was a lot of fun to give it a new look.